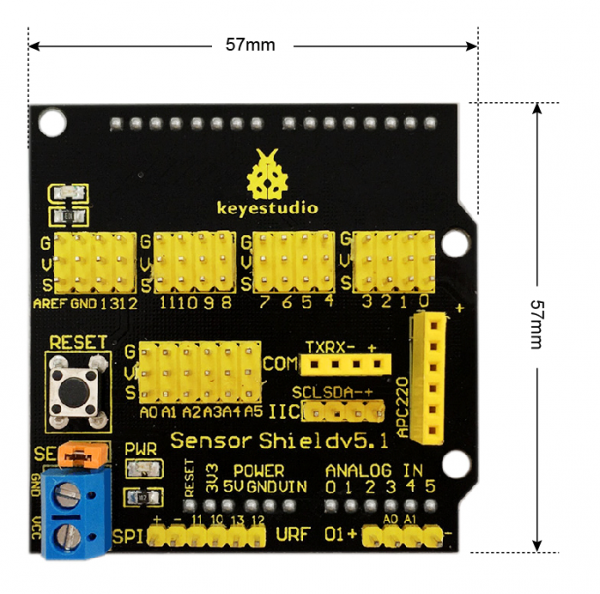 But now, with this keyestudio sensor shield, you can easily solve that problem. 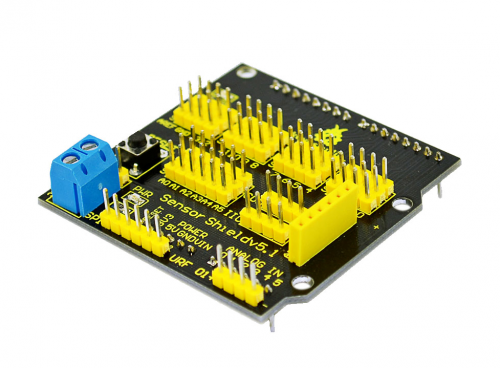 This shield is fully compatible with UNO R3 control board, so you can easily stack it onto UNO R3 for use. 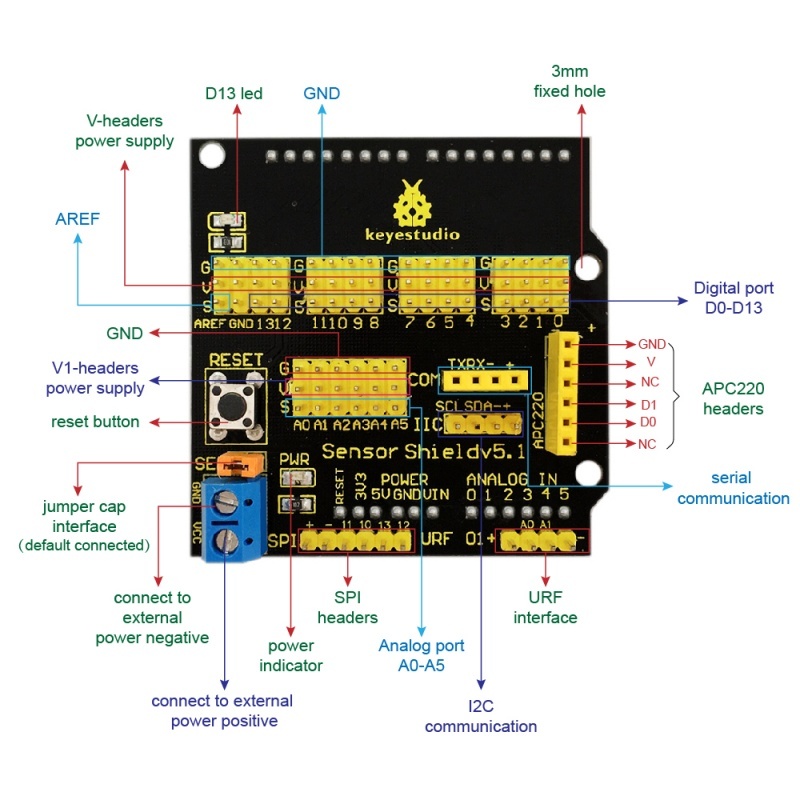 This keyestudio sensor shield has extended the digital and analog ports out as 3PIN interface (G,V, S), which can directly connect 3PIN sensor modules. It also breaks out some communication pins of 2.54mm pitch, like serial, IIC, and SPI communication. The shield comes with a reset button and 2 signal indicators as well. Additionally, you can supply the voltage needed to the sensor modules through blue terminal blocks on the shield. Because some sensor modules is not used with 5V or 3.3V but with special voltage. 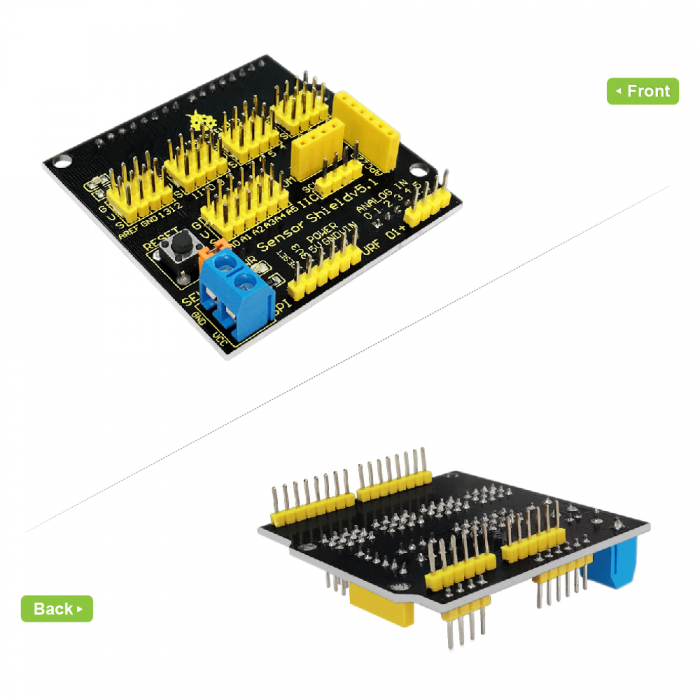 You can supply the voltage needed for sensor modules via terminal blocks. When SE is connected with jumper cap, and input DC 7V to VCC /GND terminal block, so the voltage of V, V1 and + pins are 7V. When SE is connected with jumper cap, and VCC /GND terminal block without voltage input, shield is powered via UNO R3, so the voltage of V, V1 and + pins are 5V. When SE is disconnected, input DC 7V to VCC /GND terminal block, so the voltage of V pin is 7V, the voltage of V1 and + pins are 0V. When SE is disconnected, and VCC /GND terminal block without voltage input, shield is powered via UNO R3, so the voltage of V pin is 0V, the voltage of V1 and + pins are 5V. You can stack the shield onto UNO R3 board. 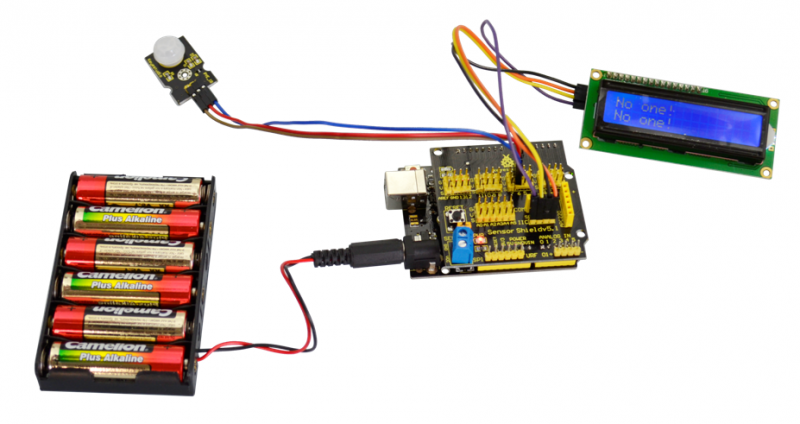 Use a PIR motion sensor and LCD display to build the circuit experiments. This page was last edited on 18 April 2019, at 13:03.